U.S. 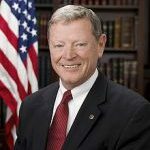 Senator Jim Inhofe is well known in his home state of Oklahoma and here in Washington as one of the most conservative members of the United States Senate. Senator Inhofe considers one of his unique qualifications for office to be the 30 years he’s spent in the business community being over-regulated by the federal bureaucracy. Throughout his political career, Jim has been a strong advocate for the principles of limited government, individual liberty, and personal responsibility. He believes that the federal government works best when it returns dollars, decisions, and freedom to our local communities and families. 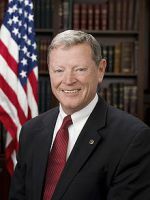 During his tenure in Congress, Inhofe has forged a distinguished legislative record on a diverse range of issues. 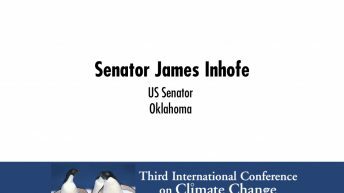 Yet Senator Inhofe may be best known for his work to stop Congress from imposing economy-wrecking climate tax on the American people through his position on the Senate Environment and Public Works Committee, where he serves as chairman. 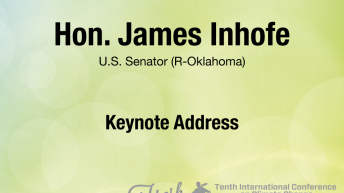 Inhofe is a lifelong Oklahoman who grew up in Tulsa and graduated from the University of Tulsa with a degree in economics. He served in the U.S. Army and has been a small businessman working in aviation, real estate, and insurance for more than 30 years. He was elected to the United States Senate in 1994 to complete the unexpired term of Senator David Boren and has been re-elected in 1996, 2002, 2008, and most recently 2014.